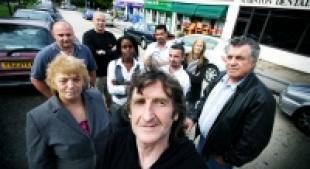 Shopkeepers claim their businesses are struggling because parking restrictions are not being enforced in their street. Traders in Cherwell Drive, Marston, Oxford, said Oxfordshire County Council had not installed signs for a two-hour parking limit, which were due to go up in July. They said cars were left all day in spaces set aside for customers - with some occupied by second-hand vehicles for sale. Sean Woodward, owner of Pets and Paws, said since residents only parking was introduced in surrounding roads last year, sales in his shop had fallen by almost a third. He said people were leaving their cars in 40 spaces earmarked for shoppers next to the parade. He said: "This is the first year that sales have gone down. I know that it's because of the parking situation because I've been told by my customers. "We have been promised that something would happen since the beginning of this year, and it just seems that they keep saying something every now and then to keep us quiet. "The spaces are always full. I can see builders parking here all day but other than that I've no idea who is filling the spaces. It certainly isn't customers." Sandra Kerwood, who owns Seasons Delicatessen, added: "I'm really disappointed that nothing has been done. "I only bought the shop last year. As with most businesses you wait until the second year to get a proper idea of how things are going, but this coincided with the parking problems around here. Things have been quite bad. "I would definitely say this is affecting me. I rely on lunchtime trade. If people can't park up and run in and grab a sandwich or a bite to eat, they go elsewhere. It's as simple as that." Neighbourhood activist Mick Hainessaid he raised the problem at a north east area committee meeting in July, when the zone was supposed to be introduced. He said: "I think it's disgusting when the council told me it was going to be done in August and now here we are in September and still waiting. "People have told me they don't use the shops any more because they can't park outside. I've even heard that people are leaving their cars outside while they go off up to the John Radcliffe Hospital for treatment." David Tole, of the council's traffic team, said: "It was hoped the scheme would be in place by the end of August. "But unfortunately this has been delayed due to persistent wet weather, which makes it very difficult to plan lining works to mark out new parking bays. We are confident the work will be completed by the end of September and would like to apologise to the traders for this delay." In response to Roy Peach's letter, Shut up all you moaning minnies (Oxford Mail, August 12), we have nothing against the Scouts or the use of the Scout Hall in William Street, New Marston, Oxford, by the local community. What we are concerned about is that the refurbishment was not put for tender, but was allocated to Oxford City Council's in-house contractors, Oxford City Homes. I sent a letter asking for a breakdown of the costs to the council's chief executive, Peter Sloman. The reply breaks the work down as follows: materials £37,014.40; labour £64,500.26; fees £15,227.20; total £116,741.86. According to the north east area committee agenda, the work proposed was minimal upgrading of the toilets and creation of unisex disabled toilet £20,000; minimal repairs to the building fabric £5,000; minor improvements to kitchen and kitchen access £3,000; provide entrance ramp and improve entrance doors for disabled people £12,000; general repairs to the roof and dormer windows £5,000; drainage and damp proofing works £10,000; heating, hot water and ventilation works £9,000; power, lighting and fine alarm systems £18,000; contingency sum £5,000; fees at £13,000; total £100,000. The £12,000 ramp has no handrail for the disabled. So if someone was to wear a ballgown, do you think a red carpet could be laid on the ramp? Residents are calling for more lighting along an Oxford cycle path following an attack on a student which left him fighting for his life. Oxford University student Kentaro Ikeda suffered severe head injuries on the cycle track that runs across the University Parks and into Ferry Road, in Marston, last week. The section of the cycle path is well lit, but residents say the rest of the route from the end of Ferry Road into Croft Road Park is not. Croft Road resident Mick Haines, who campaigned to get lights installed along the cycle path last year, has urged the city council to act. He said: "This is a well-used route by cyclists and it's ridiculous that it has no lighting. A lot of people are worried since the attack and we want something done about this. "It was a serious attack on that poor student and it happened on a well-lit stretch of cycle path. "People are afraid to come across there and, as the winter comes, it's only going to get darker earlier. "I gathered almost 700 signatures from people living around here last year supporting calls for more lighting and there has been nothing." His wife Janice said: "This is a really convenient route for people coming from town to Marston, in particular Cherwell Drive and Old Marston. We need this now before anyone else gets hurt." 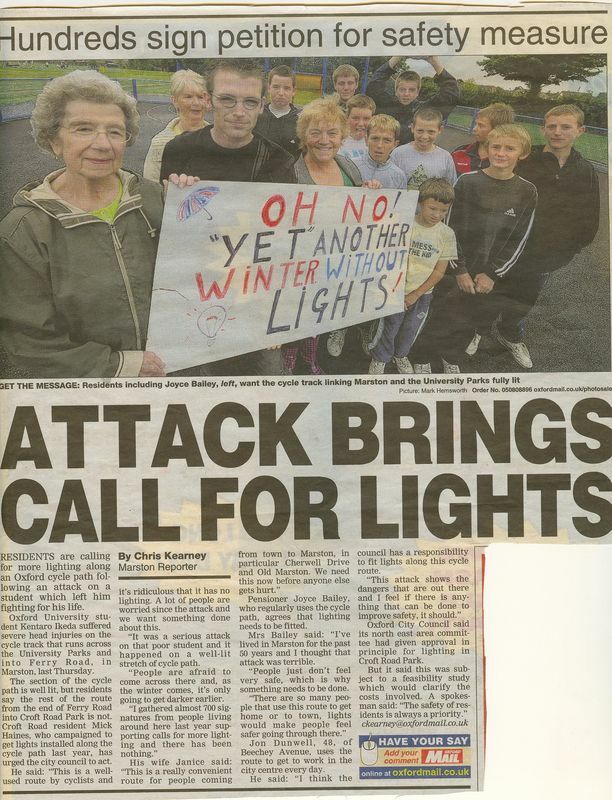 Pensioner Joyce Bailey, who regularly uses the cycle path, agrees that lighting needs to be fitted. Mrs Bailey said: "I've lived in Marston for the past 50 years and I thought that attack was terrible. "People just don't feel very safe, which is why something needs to be done. "There are so many people that use this route to get home or to town, lights would make people feel safer going through there." Jon Dunwell, 48, of Beechey Avenue, uses the route to get to work in the city centre every day. He said: "I think the council has a responsibility to fit lights along this cycle route. "This attack shows the dangers that are out there and I feel if there is anything that can be done to improve safety, it should." Oxford City Council said its north east area committee had given approval in principle for lighting in Croft Road Park. But it said this was subject to a feasibility study which would clarify the costs involved. A spokesman said: "The safety of residents is always a priority." 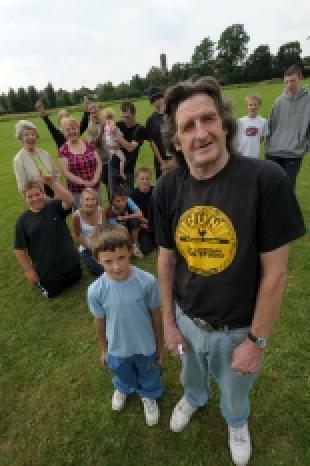 Campaigners are celebrating after learning their fight for a new community park in Oxford has been successful. The city council has negotiated a 40-year lease on land owned by the county council, that was part of the grounds of the former Milham Ford Girls School, in Marston Road. It will be spending £150,000 from a housing developer on the park. Work is set to begin in September. Marston resident Mick Haines said: "This is great for the whole of Marston and will be something that everyone living in the area can use. "It's a fantastic boost for everyone down here, because in the past we felt Marston hadn't been given the same attention as other areas such as Blackbird Leys and Barton. "The work they plan on doing here sounds fantastic and it will give kids, parents and even older people, a place to go and enjoy themselves." Mother-of-two Nicola Bowers, of Marston Road, said the park would be well used by people in the area, including her children Daniel, 13, and Sophie, 11. She said: "The kids will love having a new place to go and play and from everything the council has said it will offer something a bit different." Milham Ford Girls School closed in 2002. Part of the site was sold off to developer Berkeley Homes to build 50 new houses, and money from the firm earmarked for local facilities will be used to create the park. The former school buildings were taken over by Oxford Brookes University's school of health and social care. George Evans, 76, of Marston Road, said: "It's been on the agenda for a long time, but nothing had happened. It will be nice to have it just across the road and I'm sure I'll be going over there with my grandchildren once it's finished." A city council spokesman said: "Improvements will include provision of a play area, tree planting, fencing, footpaths, ponds and removal of old tennis courts to create an ecology area. "Work has started to bring a grass area back into use for sports. The main work is programmed to start in September and should be completed in 12 weeks." Residents in Marston, Oxford, have been told they will have to wait five years for a new bus shelter. Croft Road resident Michael Haines claimed Marston was at the bottom of the city council's list of priorities. He said: "Barton and Risinghurst are not waiting for five years for new bus shelters. Neither is Blackbird Leys. "There are some that are going in sooner. Why are we being made to wait as long as this when other areas are not? "It's wrong, and I feel this is yet another example of Marston being forgotten while other areas get the work done." Oxford City Council has pledged to install more than 180 new bus shelters across the city over the next five years. Its schedule of work in Marston will see four new shelters installed in the first year, three in the second year, four in the third year, one in the fourth, and one - in Marston Road near the junction with Jack Straw's Lane - in the fifth. Mr Haines added: "There are a lot of elderly people in the Marston area who use buses to get about. New shelters are vital to them. "Our shelters have windows missing, holes in the roof, and are badly vandalised. We desperately need the new shelters." George Evans, 76, of Marston Road said: "I think it's disgusting we have to wait as long as that for the new shelters, even three years is too long. "The bus stop opposite my house has no seats for old people to sit down and they are forced to stand and wait. There is no point doing half at a time, they should do them all at once." Mother-of-two Hillary Godfrey, 45, of Lynn Close said: "Surely carrying out the work in dribs and drabs like this is going to cost the taxpayer more money. "Why not stick to one area and get it all done at once?" Oxford City Council said there were other bus shelters due for installation in year five, in Banbury Road, Cowley Road, Abingdon Road and St Aldate's. Council spokesman Chris Lee said: "It is inaccurate to say Marston is at the bottom of the priority list for new shelters. Priority is given to areas where shelters are in most need."